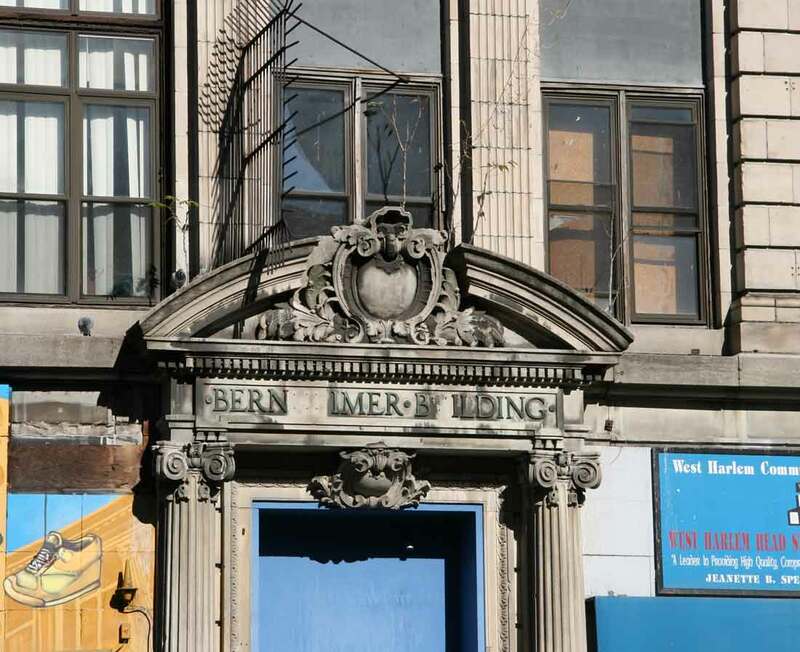 Contrary to information posted elsewhere on the internet there does not seem to have been a Bernheimer Department Store in New York City. There was a famous Bernheimer Brothers Department Store established in Baltimore in 1884, but this company did not have a New York branch. Instead, the Bernheimer Building here on 116th St. in Harlem was a modest two-story office building constructed by the Bernheimer family who were brewers at, first, the well-known Lion Brewery owned by the firm of Bernheimer & Schmid, at 108th St. and Columbus Ave. (Click for Lion Brewery ad from 1881. ), and, later, the Bernheimer & Schwartz Pilsner Brewing Company at Amsterdam Avenue and 128th Street. (Click for Bernheimer & Schmid ad from 1899.) The building seems to have been purely a speculative real estate venture and not to have had any connection with the business of the Bernheimer breweries. The Bernheimer Building was constructed in 1906, and it is described at www.metrohistory.com as a "2-sty and basement brk and stone store and office building, 100.11 x 200." The owner was Paul Mayer, 244 W. 102nd St., and architects were Townsend, Steinle & Haskell, 29 E. 19th St.
Acquisition of the property on this corner of 116th St. and Lenox Ave. was reported in the New York Times, 2 March 1905, pg. 14, "Simon E. and Max E. Bernheimer have bought, through Paul Mayer, from Mandelbaum & Lewine and Lowenfeld & Prager, for $94,000, the plot 100 by 100.11 on the north side of One Hundred and Sixteenth Street, 100 feet west of Lenox Avenue. The buyers recently bought the adjoining corner from the same operators, and now have a site 200 by 100." Several newspaper reports mention leases in the early years of the building. In 1907 these included the Mutual Alliance Trust Company, Maurice Reinhardt for the Garden Amusement Company, and the religious school of the Sisterhood Hope of Israel. Things were a little more lively in 1911 when "Deputy Police Commissioner Flynn, at the head of a band of raiders, invaded Harlem yesterday afternoon, battered down the door of the Mauretania Club, a gambling house on the second floor of 107 West 116th Street, interrupting about 150 men who were playing several games of chance or betting on the races at Jacksonville" (New York Times, 3 Mar 1911, pg. 3). In 1920 the Times reported a fire that swept "through the two-story Bernheimer Building at 107-111 West 116th Street. ... flames bearing down on the branch of the Chatham and Phenix National Bank located in one of the dozen small stores in the ground floor of the building." In 1937 the Times reported, "The City of New York has leased space on the second floor of the Bernheimer Building, at the northwest corner of Lenox Avenue and 116th Street, for a courtroom to be occupied by the Tenth District Municipal Court.... Meyer & Steffens, Inc., broker, arranged the contract for the estate of S. & N. R. Bernheimer." In 1948 "Fifty foot and mounted policemen, and sixty detectives were sent to Harlem late last night as a precautionary measure following a disorder in the afternoon in a food market at 101 West 116th Street, at Lenox Avenue." In 1969 the nearest thing to a department store opened in the Bernheimer Building when Woolworth opened a store here. The members of the Bernheimer family directly involved in the Bernheimer Building were Simon Emanuel Bernheimer (1849-1911) and Max E. Bernheimer (1855-1913). Both Bernheimers died suddenly and in dramatic fashion. As described in the New York Times, 26 July 1911, pg. 1, "While playing the bass drum in the Mystic Shriners' Mecca Temple band, which was rehearsing in the Murray Hill Lyceum in East Thirty-fourth Street, shortly after 9 o'clock last night, Simon E. Bernheimer, head of the Bernheimer & Schwartz Pilsner Brewing Company, 128th Street and Amsterdam Avenue, dropped dead of apoplexy. ... Mr. Bernheimer was one of the wealthiest brewers in the city. He lived at 107 West Fifty-seventh Street with his sister Florence. He was unmarried. His partner, Anton Schwartz, who was President of the brewery bearing his name, committed suicide on Nov. 6 last year in his apartments on the third floor of the Central Park View apartment. Grief over the death of his son, Adolf, who died at the age of 24, was given as the cause of his suicide. ... Mr. Bernheimer was 62 years old." Max Bernheimer also made page one news, New York Times, 25 Sep. 1913, pg. 1, "Max E. Bernheimer, President and Treasurer of the Bernheimer & Schwartz Pilsner Brewing Company at Amsterdam Avenue and 128th Street, died suddenly in Part IV, of the Supreme Court in Brooklyn yesterday afternoon during the trial of an action for damages against his company. He had just finished giving testimony, an ordeal on the witness stand that appeared unpleasant to him, and was about to sit down beside the counsel table when an attorney for the plaintiff put a subpoena into his hands, directing him to appear at the hearing of the suit in the same court to-day. Mr. Bernheimer rose suddenly from his seat when the paper was handed to him. His irritation was evident. He hurried over to the desk of Court Clerk George M. Conrady, and pleaded that he have Justice Van Siclen, the trial Judge, specify a certain time to-morrow when he could come to court. He said he did not want to stay away from his business all day and wait to be called as a witness. Justice Van Siclen arranged with counsel to notify Bernheimer when he was wanted in court, and the brewer, flushed with excitement, walked back to a seat near his counsel, where he, as soon as he was seated, was seen to throw up both his arms and fall to the floor unconscious. ... The body was removed to the Bernheimer home at 39 West Seventy-second Street, Manhattan. Mr. Bernheimer was 65 years old, and was born in New York City." The original Bernheimer was the father of Simon and Max Bernheimer, Emanuel Bernheimer (1817-1890). Emanuel Bernheimer's obituary in the New York Times, 29 March 1890, pg. 4, read, "Emanuel Bernheimer, one of the owners of the Lion Brewery and one of the oldest brewers in this part of the country, died at his home, 351 West Fifty-fifth street, on Thursday, from complaints incident to his advanced age. He had not been in good health for several years, and for some months was unable, save rarely, to leave his house. The funeral will be held at his home to-morrow at 9:30 A.M., the Rev. Dr. Gottheil officiating. The burial will be in the Salem Field Cemetery, the Rev. Dr. Silverman leading the services at the grave. Mr. Bernheimer was born in Germany in 1817, and served an apprenticeship of some years in a brewery in his native country before he came to this city in 1844. When he arrived here it was with some capital, and he engaged in the general importing business in Beaver-street. In 1850 he formed a partnership with August Schmid, and, recognizing the possibilities of brewing in this city, established the Constanz Brewery in East Fourth-street. This was one of the first breweries started here, and it was successful beyond the hopes of the partners. Hundred and Eighth-street, which, with its additions of a big garden and a park for picnics, soon became quite famous, parties being made up in all parts of the city to take the then long trip to Lion Park for an evening's enjoyment. Mr. Bernheimer began the extensive and elaborate system of advertising which is now a characteristic of the trade, and was the first to establish beer saloons of his own in various parts of the city, gradually disposing of them to their lessees, much the same as is done at present. Under the firm name of Speyer & Bernheimer he continued the business for several years. About 1868 the firm was reorganized by the admission of August Schmid, and a year or so later it was changed into Schmid & Bernheimer by the admission of Joseph Schmid. In 1878 Mr. Bernheimer retired from active participation in the brewery business, his son, S. E. Bernheimer, succeeding him. The business was carried on under the name of Schmid & Bernheimer until Mr. August Schmid died in July, 1889. Then the firm was composed of Mr. Bernheimer's three sons, S. E., Max E., and Henry Bernheimer. During the civil war Mr. Bernheimer was a liberal contributor to the various funds which were then established. He was a Democrat throughout his life, following his party in national affairs. In local politics he was disposed to be independent. He was one of the oldest members of the Temple Emanu-El, was an active participant in the work of the German Widows and Orphans' Society, a patron of the Mount Sinai Hospital, the Hebrew Orphan Asylum, the German Hospital, and the Montefiore Home for Chronic Invalids. Besides his sons, he leaves one daughter. His wife died four years ago to-day."